Should I also start a Turkey news section? Today, about 70 anarchists from İstanbul, Ankara, Yalova and other cities (Eskişehir Anarşi İnisiyatifi, Ankara Anarşi İnisiyatifi, İstanbul Anarşi İnisiyatifi ve Devrimci Anarşist Faaliyet), gathered in Eskişehir in a commemoration action for their comrades (Alper Sapan, Evrim Deniz Erol, Medali Barutçu, Serhat Devrim) who were killed by suicide bomb in Suruç (Pirsus) last week. When anarchist gathered and started to march, police suddenly attack and arrested 17 anarchists. Anarchists who gathered in front of Migros (Adalar) and started to march were attacked by police. And 17 anarchist arrested. Other activists dispersed to the streets and cafes. Then, fascgist groups appeared in the streets to annoy the protestors. Some fascists applauded police who were arresting some anarchists. Meanwhile, police tried to criminalize the protestors and anarchists by a bomb warning in the city center. Already they blokaded roads, they increased the security in the center. Then they exploded the package with fuze on the street. For now we don’t have more details about arrestees. 17 anarchist arrested and police doesn’t allow the arrestees to talk with their lawyers. Some police hit some lawyers of arrestees. We’ll give more updates soon. 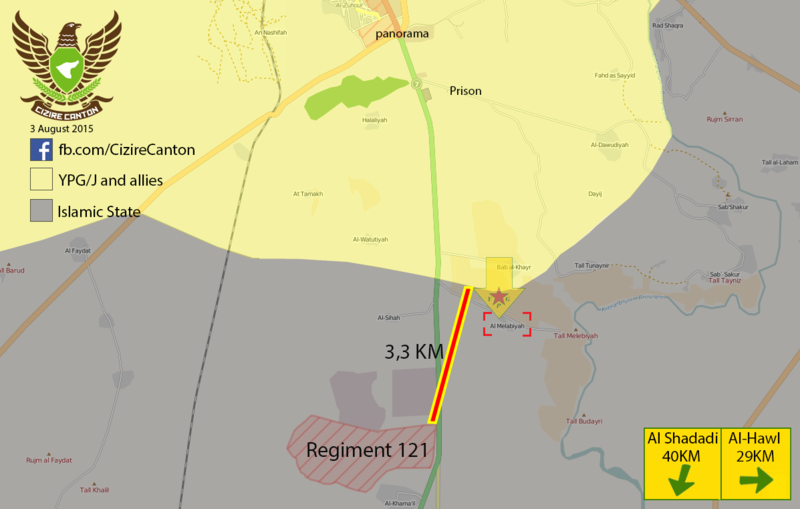 KOBANI, Rojava (July 26, 2015) - At 4:30 July 24 in western Kobani, the Turkish Army shelled the People’s Defense Units and the Free Syria Army’s positions in the village of Zormikhar in front of the terrorist-occupied town Jarabulus – using heavy tank fire. In this attack four fighters of the FSA and several local villagers were injured. Today at 22:00, the Turkish army again shelled the same village with 7 tank rounds. At 23:00, one of our vehicles came under heavy fire from the Turkish military east of Kobani (west of Tel Abyad) in the village of Til Findire. Instead of targeting IS terrorists’ occupied positions, Turkish forces attack our defenders positions. This is not the right attitude. We urge Turkish leadership to halt this aggression and to follow international guidelines. We are telling the Turkish Army to stop shooting at our fighters and their positions. Even the capitalist media in the UK is quoting commentators saying that the Turkish action with support from the USA government, is effectively using limited, if real, action against ISIS primarily as cover for action against the PKK and it's supporters (though we assume not other Kurdish factions) both within Turkey and in Syria and Iraq which indicates the likely further spread and intensification of the militarised conflict. The specific attacks on the YPG have not been reported here yet and it is unclear if this may give rise to further tensions with other European, including NATO allies of the USA. However it is not very certain how will this new game will be played, and whether Kurdish freedom movement has any good chance to respond to it by preserving its principles and projects for people's democracy first in Kurdistan and later in Middle East. On 5 October 2014, we lost our friend, comrade, and colleague, the sociologist, translator, writer, and revolutionary Suphi Nejat Ağırnaslı while he was fighting ... in Kobane. Condolences to all, and may he rest in peace. On his MLKP membership: It is a bit complex. He was orginally member of ESP, a group close ot MLKP, later he quit that group formed his own ideas and generated original writings (see the text, in which he was into trying to develop a local discourse for communism [menkıbe] and his writings were not excluding anarchist and especially the anarchist syndicalist tradition [his text on information workers]) It appears he joined MLKP not directly because of its ideology but more like because it was the easiest way for him to go to Kobane and be useful in the war [My speculations: he possibly did not know some people there, he did not know Kurdish etc...] There was even a some problems between ESP and his family about who should make his funeral and how. So I advise you to read his story as you would read a biography of a comrade, and try to not stuck with MLKP so much to understand his own importance. ISIS withrdaws from Hasakah. Over the course of the battle, SAA/NDF ceded much territory to YPG/YPJ/MFS/Al-Senadid. One important detail in regards to the TEV-DEM administration of justice and the involvement of Syriac Christian allies with the YPG is the outcome of the recent trial in regards to the murder of Khabour Guards Chief Dawud Jendo. His murderers were YPG. YPG turned Jendo's murderers over to the civil court of the Cizire Canton, which found them guilty and sentenced 20 years prison for the 2 killers, 4 years and 1 year for the 2 others. The floor is open for debate about how a libertarian communist society would deal with such a situation. 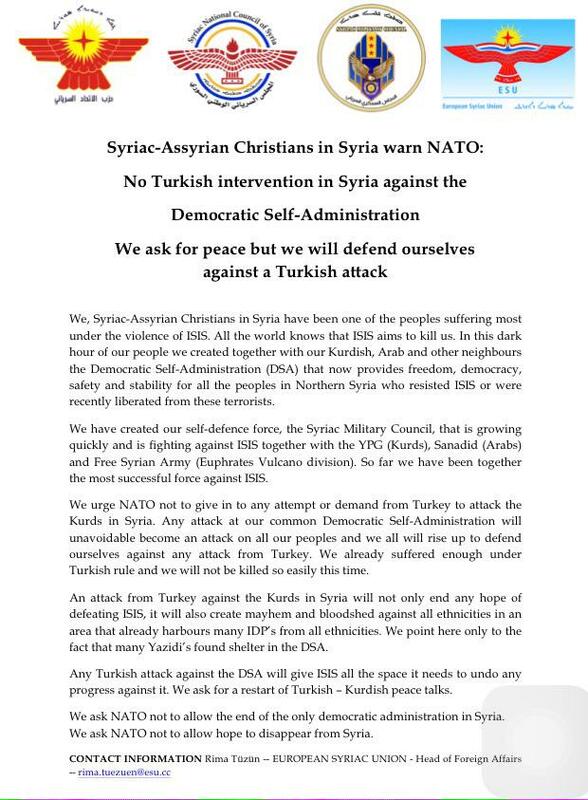 The Syriac Military Union/Syriac Union Party/Syriac National Council of Syria/European Syriac Union issued a statement against Turkish intervention in Syria and stating they would defend themselves. This isn't all surprising, but some disapora Assyrian groups made claims that the Jendo murder was weakening the relationship between Syriacs and the PYD/YPG. If you look at the above map of Hasakah, the Syriac MFS had their territorial responsibility increased in the city (those are likely Christian neighborhoods). It is a strong statement in the Syriac support of TEV-DEM. Some German politicians are threatening to withdraw their Patriot missles from Turkey. Bombing the PKK: It’s the (domestic) politics, stupid! "In the wake of the raid that killed Abu Sayyaf, suspicions of an undeclared alliance have hardened. One senior western official familiar with the intelligence gathered at the slain leader’s compound said that direct dealings between Turkish officials and ranking Isis members was now “undeniable”. Never fear, Fox News is still run by idiots. Here is a long list of links pertaining to recent events involving Turkey and the PKK. Interesting Poll Results from CNN Turkey on Turkey's involvement in Syria. even has opinion broken down by political party. 1st image: Who do you want to control northern Syria? 2nd image: Would intervention in Syria be beneficial or harmful for Turkey? 3rd image: Would you agree if Turkey intervene in Syria? 4th image: Do you agree with rumours that some government agencies help radical islamist organisations? 5th image: Should Turkey go to war with Syria in order to overthrow Assad regime? 6th image: Do you find the state's Syrian policy since the beginning successful? 7th image: What is the biggest threat at Syria border in your opinion? 8th image: See 1st image. Rmeilan oil field of Syria's Hasakeh province, where the Kurds, having fought off jihadists, are extracting and refining oil for the first time. 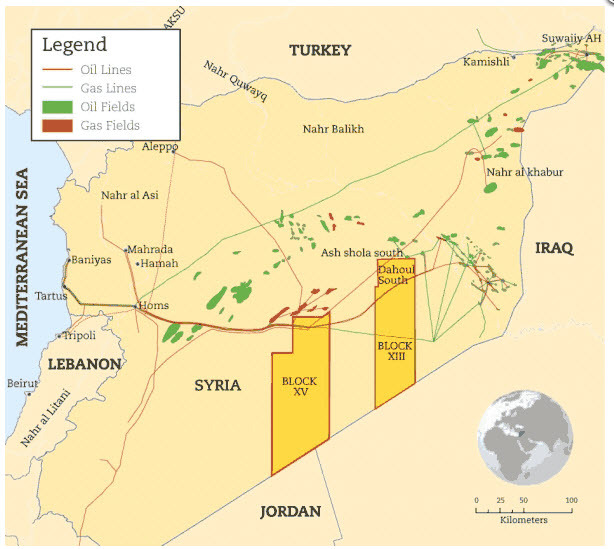 Located in the middle of the desert in the northeastern province of the war-torn country, Rmeilan is Syria's largest oil field in terms of surface area. Before the conflict, the oil from Rmeilan was transported to the country's two refineries in western Banias and central Homs regions. Last summer, the local administration decided to take matters into its own hands, restarting extraction at 150 wells and creating around 20 makeshift refineries. The Kurdish operation in Rmeilan now produces around 15,000 barrels of oil a day, more than the barely 10,000 bpd that Syria's government generates. "We defended these installations and these wells with hundreds of martyrs," he said, watching a handful of workers on the field. The restarted oil flow has been a major boon after years of hardship in the area. Khalaf said the Syrian government had helped get Rmeilan's wells back online by providing raw materials such as oil for turbines and spare parts. Damascus also continues to pay the salaries of the handful of former government employees who have gone back to work in Rmeilan. The gasoline produced at the site is bad quality, but it sells for much less than that produced by the government in the few oil wells it still controls. The gasoline distributed by the state costs 400 Syrian pounds ($1.3) a litre, compared to around 150 for the local product. 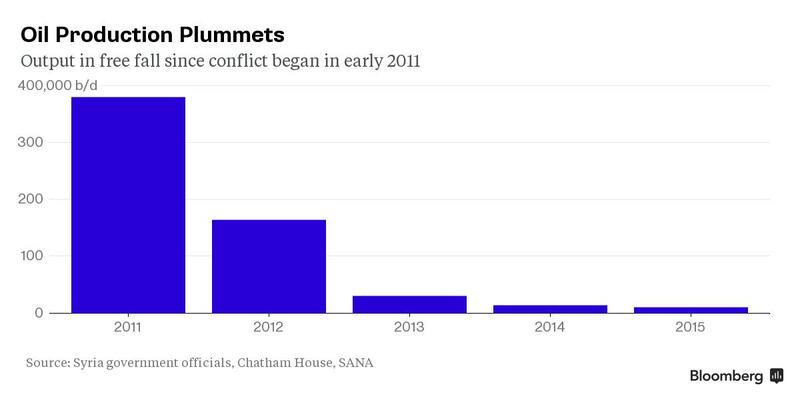 The conflict has devastated Syria's oil industry, which was producing 380,000 barrels per day before the conflict. Khalaf said he would be willing to coordinate with the regime on oil production, as long as the Kurds continue to benefit financially from the work at Rmeilan. "If the route to the refineries in Homs and Banias reopens, we'll start pumping through it again immediately," he said. "But on condition that the Kurdish region gets a fair part of the oil revenue." "If the route to the refineries in Homs and Banias reopens"
That's unlikely to occur as long as ISIS exists. There is a lot of ISIS between Hasakah and Homs. TEV-DEM would need Islamic State out of the way. 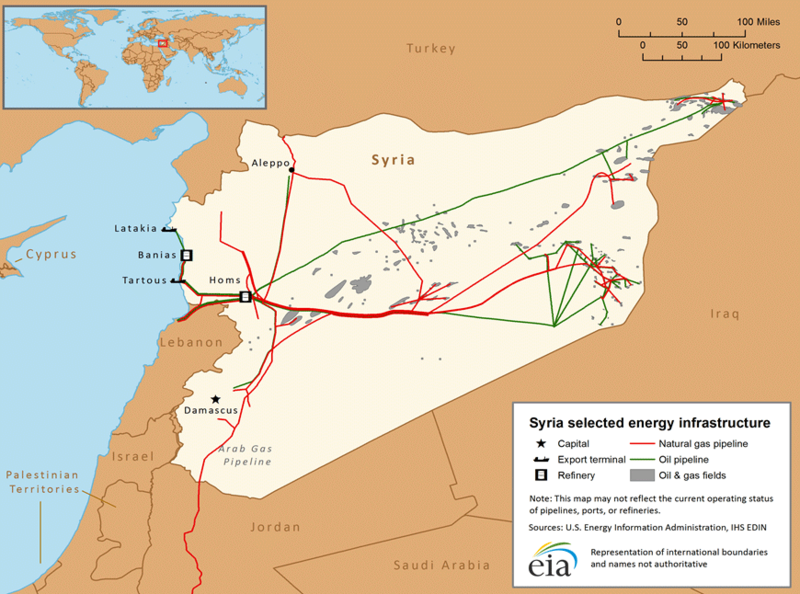 The Oil Line goes through Deir ez-Zor and the Natural Gas line through ar-Raqqah. 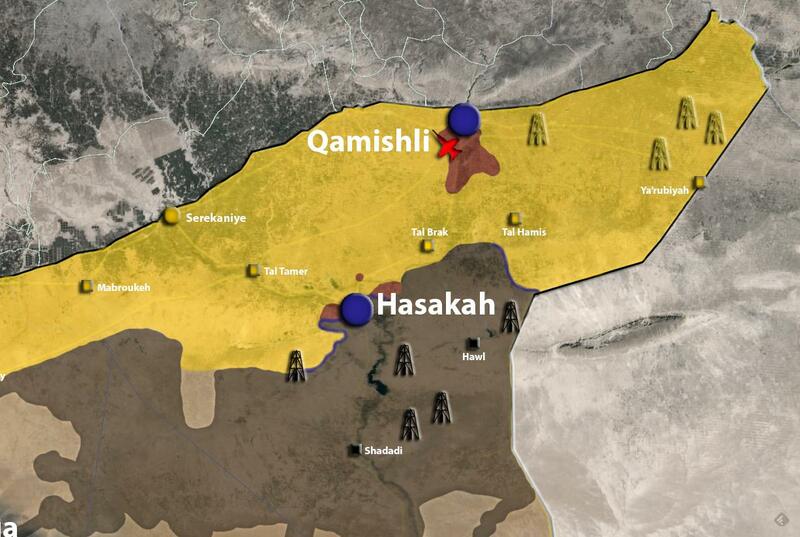 Strategically, now that YPG controls the southern side of Hasakah city, it will logically push ISIS further south. YPG may try to push another 60 kilometers down Route 7 to Al-Shaddadah and the nearby Jbeysa oil field--"one of country's largest". This would reduce the threat of attack from ISIS to the population center in Hasakah, remove some of ISIS revenue from oil sales, and secure that oil for Rojava. The May-June 2015 ISIS offensive against Hasakah city began in Al-Shaddadah. Once Al Hasakah and surrounding areas have been secured, the Peshmerga forces and other Syrian rebel groups will be encouraged to attack Ash Shaddadah to the south, in order to close down the key ISIS road leading to Sinjar, Tel Afar and Mosul. But this now reverts back to the Syrian rebels. They must be prodded to sustain the momentum and to take the fight back to ISIS by destroying their base at Ash Shaddadah. Coalition airpower should continue to support the Syrian rebels in attacking Ash Shaddadah. The defunct Iraq-Syria pipeline isn't an option, even with repair as it comes in near the Akkas oil field south of Al Qa'iam, which is southeast of Deir ez-Zor along the Euphrates. This is all ISIS held territory. That pipeline in Iraq/KRG can eventually lead to Ceyhan in Turkey. That would be the same line that goes from Kirkuk to Ceyhan. 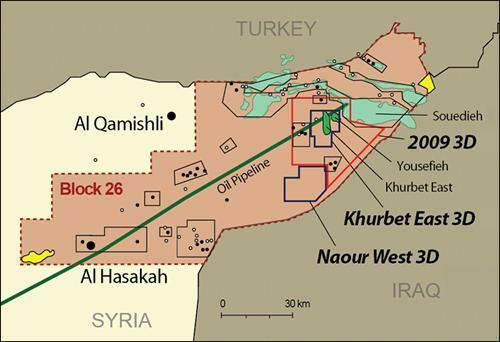 The Kirkuk-Ceyhan pipeline is prone to sabotage and passes by ISIS-held Mosul. But northwest of Mosul, KRG connected the pipeline to Taq Taq and Tawke fields through h Khurmal and Dahuk for export to Ceyhan. 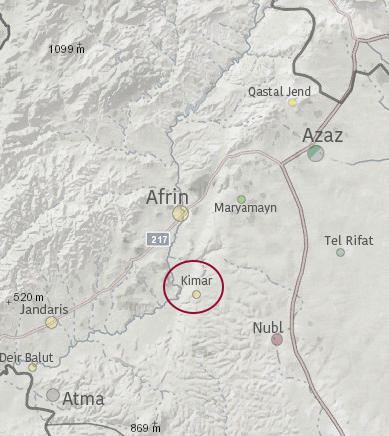 Folks will also notice that some of the PKK camps bombed by Turkey recently are in Northern Iraq/KRG; not far from the Kirkuk-Ceyhan's line before it crosses into Turkey. The PKK bombed the Kirkuk-Ceyhan pipeline on 7/29/2015 in the Sirnak province (northeast of Cizire canton) and/or the pipeline in Agri. If Turkey wants oil from KRG, then they need to make a deal with or neutralize the PKK. 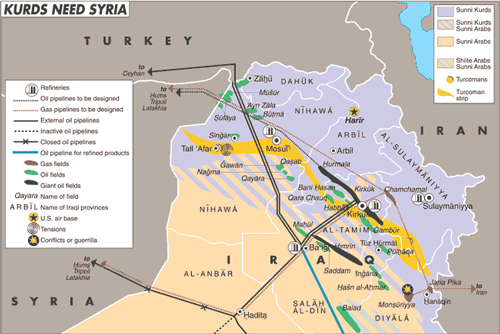 If Cizire Canton wants to sell oil, it has to do so by either working out a political deal with KRG and/or Turkey; or it has to eliminate ISIS from ar-Raqqah, Deir ez-Zor and the rest of the Euphrates river. Economic development is occurring along the lines set forth by the leadership of the Kurdish Freedom Movement, and current economic growth is being led by newly found communes, committees, unions and civil organizing as part of the democratic economy model. In the Efrîn canton alone, where hardly a workshop existed under the Baath regime, a new 84 thousand square meter industrial park close to the Eşefiyê neighborhood is now home to at least 800 workplaces providing for the livelihood of 5 thousand families. Despite having a pre-war population of only around 200 thousand there are currently over 1 million residing in the canton. The new industrial park is helping to employ thousands of people. All work in the industrial park is organized by committees, unions and civil society organizations attached to the communes. Despite this success many locals still complain about the expense of vehicle batteries, agricultural equipment and certain machine and plastic products. Supply shortages due to the war are largely to blame for the rising costs. Adding that the economy was developing as part of the project of Democratic Autonomous Administration and that a a project was currently under to way to find a location for 150 new workspaces. So that is a really exciting claim. I'm interested in hearing more about this if anyone comes across it. Thanks for the link Flint. 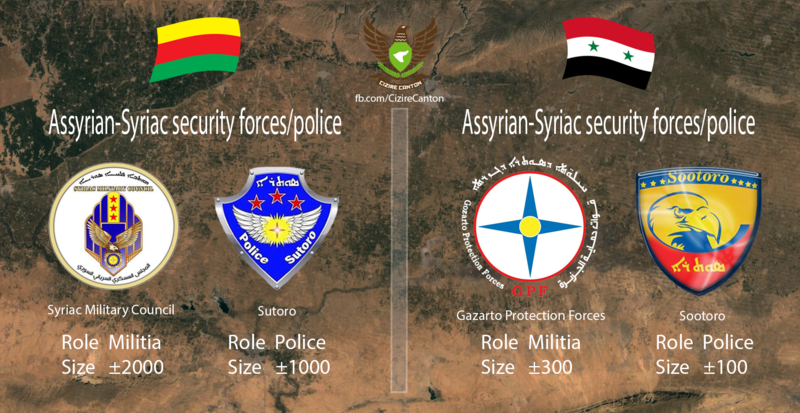 This has been claimed before, but Efrin seems to be expanding its productive capacity on that model, and when it expands, it seems to be largely collective. "Worker administration is the third leg of the stool of the economic plan. Workers are to control the means of production in their workplace through worker councils that are responsible to the local councils. According to the Ministry of Economics, worker councils have only been set up for about one third of the enterprises in Rojava so far. Worker councils are coordinated by the various economic ministries and local councils to assure a smooth flow of goods, supplies, and other essentials. The PEP also calls for all economic activity in the cantons to be ecologically sound. It is unclear who has responsibility for this, whether it is the workers’ councils, the local councils, the City Councils, or the Peoples’ assemblies. Throughout the various statements from the economic ministries, one sees mention over and over again about the primacy of ecologically sensible industry—but details are lacking. 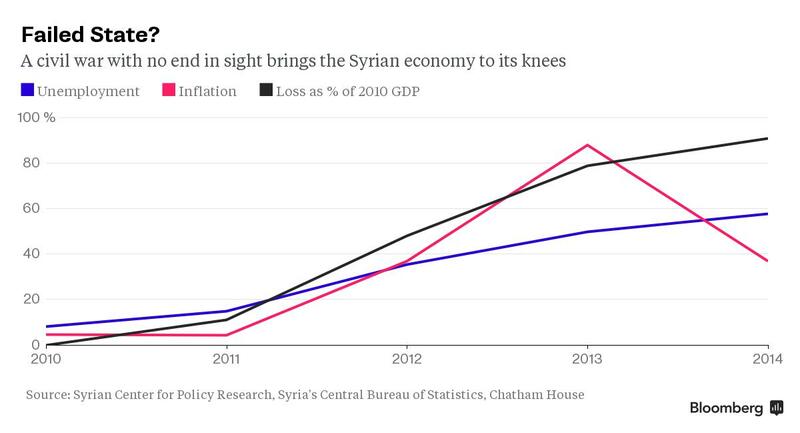 "The PEP is also vague when it comes to its relationship with other economies inside and outside of Syria. A substantial amount of the current economic activity in the region comes from black market oil being sold outside the region. In Autumn, 2014, representatives of Rojava travelled around Europe looking to create “trading partners” and seemed to be suggesting a standard free market policy, while at the same time eliminating banks and other financial institutions inside Rojava. The Rojava canton principles also clearly state that the region will not produce its own money or bonds, so it is unclear how such trading relationships between other governments would actually come to pass even if the embargo is lifted." Btw, this link you shared is from Ozgur Gundem, which quite frequently publishes short news on the current state of cooperatives and other social economic initiatives. I can actually translate them if people are interested. To be honest though most of them announcements of opening of new communes or cooperatives, and others are sort of agitation on how well they are doing. The U.S. train and equip program for "moderate" Syrian who would pledge to fight ISIS (but not Assad) was supposed to find 5,000 recruits. it only graduated 60. Called Division 30, the U.S. still sent that 60 into Syria, through the A'zaz border crossing. Jabhat al-Nusra (al-Qaeda in Syria) quickly set upon them, kidnapped the leader of Division 30, 5 were killed, 18 wounded. The survivors fled to YPG-controlled Afrin.Subsequently, US Airforce bombed al-Nusra. There have been some other minor skirmishes between YPG and al-Nusra with some attacks supposedly being enabled from Turkey allowing al-Nusra through the border.. Al-Nusra may have expanded its position in A'zaz from partial to total control. The YPG commander in Afrin previously volunteered to take over security of A'zaz from the Free Syrian Army to defend it from Jihadist groups. The US bombed al-Nusra positions near A'zaz. Life under two masters in Syria's Hasakeh, Maher Al Mounes, August 4, 2015. Article describes the dual power situation between TEV-DEM and the Syrian Arab Republic. This may have changed or is in the process of changing in Hasakah as the Syrian Arab Army and National Defense Forces ceded much of the city to the YPG/YPJ/MFS/Al-Senadid during the most recent ISIS attack on the city. Raed, a Syrian Arab living in the northeastern city, avoids passing through checkpoints run by the Kurdish People's Protection Units (YPG). "I finished my compulsory military service in the government army four years ago. The YPG are demanding that I complete their six-month compulsory service," the 28-year old told the AFP news agency. "But I have a wife and children, and I can't be away from them for that long." In the majority-Kurdish town of Amuda, 85 km north of Hasakeh, Aziz has not seen his mother - who lives in a government-controlled zone of Hasakeh - in two years. "I'm too scared to visit because I have to pass through a regime checkpoint, and they would force me to do the compulsory military service," Aziz, who has completed his YPG service, tells AFP. "Why do we, the residents of Hasakeh, have to spend our lives on the front lines and submit to double the military service?" Mansur Usi, 56, also holds two military IDs, as well as two driver's licences and two licence plates for his car - a white government plate, and another green one for the YPG. The Kurdish taxi driver and former government employee moves freely between Hasakeh city and Qamishli, a Kurdish-majority city to the northeast. "I have two driver's licences: the first is for the government, in case the state police stops me, and the second is for the Kurds, in case the Asayish (Kurdish police) stops me," he said. Bahfared, 50, owns a pharmacy in one of the areas where both government and Kurdish administrations have influence. "We suffer from the presence of two authorities: the first belongs to the government's Pharmacists Syndicate, where we pay yearly subscription fees," Bahfared said. "We are bothered by both sides ... Life in this canton means being hurt by both of them." The administration noted that Rûdaw and Orient were financed by political parties that determine coverage content in a way that shows enmity towards Kurdish people, institutions, and martyrs. This is interesting - based on something Flint sent me, my understanding was that Rûdaw is financed by the KDP and the Barzani family. Not anti-Kurdish, but controlled by capitalist interests in Iraqi Kurdistan. So is this evidence of rising tensions between the YPG and Peshmerga? Or in this case does the "war of position" not have much to do with the "war of maneuver"? It doesn't necessarily have anything to do with tensions between YPG and KDP Peshmerga (and the YPG and HPG are on good terms with the PUK Pesh). TEV-DEM shouldn't have done this because Rudaw will talk and talk about it and HRW will flag it as media censorship. Rudaw is notorious for lying, often taking a position a little more extremely pro-KDP than the KDP is willing to take. In Turkey, all these sources, both Rudaw and pro-YPG sources are banned. Rudaw reporting on Turkey banning Twitter after the Suruc bombing, Turkey also had Facebook block Rudaw's Facebook because they had shown pictures of the house of Abdullah Ocalan. Turkey censored twitter and other websites during the Kobani seige and Turkey had Roj TV shutdown in Europe. Prohibiting the press is a typical tactic by Turkey, KRG and now, unfortunately, TEV-DEM/Rojava. Even if Rudaw is a pack of bourgeois liars. "Then there emerged the objective of creating a joint force. It became necessary in order to protect the people of the region. We all knew that the Syrian revolution had gone off track. Syria is a country which is a mosaic of peoples and faiths. However a revolution that began with the demands for equality and democracy came to take on a Sunni character. The revolution fell into the hands of Salafis. Those who would not accept this oriented themselves toward Kobanê. This is how is Burkan al-Firat first emerged. The peoples of Syria needed such a force. A force that was not tied to one group of people, religious faith or sect…We are aiming for a democratic Syria. Our goal is a Syria in which everyone lives with freedom and justice and in common with one another." "Right now our forces have doubled. We said that many would come to us wanting to join following a shift in ideological orientation. Those who want to join the Burkan al-Firat must first accept our principals. These principles are a democratic ideology in which freedom and co-existence. Every place we approach those who oppose ISIS are joining us. Before I did not believe that anyone was thinking about Girê Spî. But now anytime wherever we advance people say that there will certainly fall. And this has become the faith among people. If we opened the door to everyone who came calling our numbers would probably be 10 times as large. But we have conditions that those who join us have internalized the ideology of democracy and co-existence. We as the Burkan al-Firat have been trying to bring back to life the spirit and practice of co-existence. And we have taken steps to accomplish this. We want to grow in this regard and become a force for the democratization of Syria." Posting this because it mentions collaboration between the YPG and Jaysh al-Thuwar. "after recent jihadis' attacks on the canton #HXP self defence training centre opened in Kimar village "
Jabhat Akrad and Kata'eb Shams ash-Shamal are both part of Burkan al-Furat. Jabhat Akrad is largely seen as a group setup by the PYD to act within the FSA. We may be seeing Jaysh al-Thuwar taking on a role like Burkan al-Furat; particularly if Burkan al-Furat/YPG cross the Euphrates at the Tishrin dam, and if the YPG in Afrin moves from a defensive to an offensive posture against al-Nusra and ISIS. Take this with a grain of salt as I got this news from a Daesh supporter, claims of a strike in Qamishli in Cizire canton among Tax drivers against a rise in fuel prices. One thing that has been report a lot is that TEV-DEM does set the price of fuel. Also in indicates that there is still a market economy among taxi drivers. Also indication that there is a "tarriff"/tax on taxis. Taxi drivers went on strike in the Corniche neighborhood Qamishli in Hasaka, to work, to protest against the decision of the executive body of the Kurdish self-management, raising the price of the article "diesel" by 50%, according to the correspondent of "Smart". Our correspondent says that the executive body of the self-management Kurdish in Hasaka, issued a decision to raise the price per liter of material "diesel" from 30 Syrian pounds, to 45, and raising the price of the article "gasoline" from 60 to 75, what he saw as the cabbies decision unfair against them. He said one of the drivers on strike, "Mussa al-Attiyah," told "Smart", they are demanding the concerned authorities to cut the price of the article "gasoline" and the lifting of tariff Delivery taxis, stressing that this decision affected them negatively, due to the high subjects of "gasoline" price and "diesel", but expensive cut-off switch, and that most of the drivers and the poor of this work only source of income. Managers of marauders of the desert?